容積に関する報告もある。Epididymal adipose tissue of ApoE KO mice and LpLKO mice. 2500 - 3000 µm2 (4). Brasaemle & Wolins 2012a (Review). Packaging of fat: an evolving model of lipid droplet assembly and expansion. J Biol Chem 287, 2273-2279. Fujimoto et al. 2008a (Review). Lipid droplets: a classic organelle with new outfits. Histochem Cell Biol 130, 263-279. Fonagy et al. 2001a. Physiological status and change of cytoplasmic lipid droplets in the pheromone-producing cells of the silkmoth, Bombyx mori (􏱂Lepidoptera, Bombycidae). Arthropod Struct Dev 30, 113-123. Takahashi et al. 2013a. Macrophage lipoprotein lipase modulates the development of atherosclerosis but not adiposity. J Lipid Res 54, 1124-1134. Spalding et al. 2008a. Dynamics of fat cell turnover in humans. Nature 453, 783-787. Hsieh et al. 2012a. 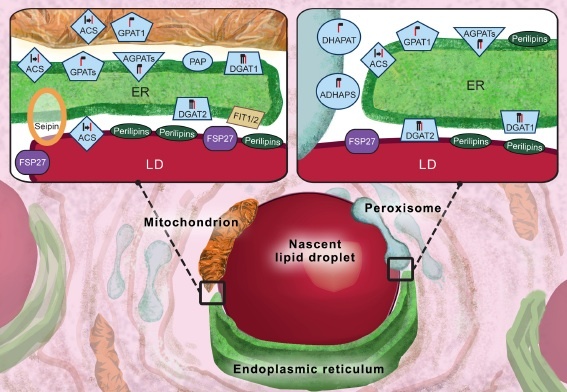 Perilipin family members preferentially sequester to either triacylglycerol-specific or cholesteryl-esterspecific intracellular lipid storage droplets. J Cell Sci 125, 4067-4076. Hsieh et al. (2012a) is an open-access article distributed under the terms of the Creative Commons Attribution License, which permits unrestricted use, distribution, and reproduction in any medium, provided the original author and source are credited. Also see 学術雑誌の著作権に対する姿勢.